Before the Holocaust, Košice was home to one of the largest and most important Jewish communities in Slovakia. In 1930, the city's more than 11,500 Jews made up 16.4 % of the total population. Jews could settle here only after 1840, when the legal ban on Jewish residence was lifted. Several streams of Judaism existed here. There were the two major communities, Orthodox and Neolog, but a Status Quo synagogue operated under the Neolog umbrella. The Chasidim were grouped within the Sepharad Association, which maintained a separate Chasidic synagogue. All this rich communal life was destroyed between May 16 and June 5, 1944, when almost all Jewish citizens of Kosice were deported to Auschwitz. Today, the Jewish community has only about 280 members. Still, it is the second largest Jewish community in Slovakia, and it strives to preserve an active life. The city has numerous Jewish heritage sites, including a large Jewish cemetery, which is still in use. Four out of the five major synagogues that operated here before the War also still stand. Two have been transformed for other use – the huge, domed Neolog synagogue serves as a philharmonic hall (the large star of David that once surmounted its dome is now used as a Holocaust memorial in the Jewish cemetery), and the Chasidic synagogue is a technical lab building. But the Orthodox synagogue on Puškinova Street, built in the 1930s, recently underwent a full restoration overseen by the Jewish community. Košice's most significant Jewish heritage site is the Orthodox Jewish community compound, which still serves as the center of Jewish communal life. The compound developed near the city center on Zvonárska [Bellmakers] street, in an area formed after the city fortifications were demolished in the mid-nineteenth century. Recent archaeological excavations here have uncovered the remains of the old town wall. The compound includes a historic mikvah (ritual bath) dating from from the mid 19th century. Here are also found the offices of the Jewish community and rabbinate, a kosher cafeteria, and a small synagogue used for regular services. In the middle of the area the old Orthodox synagogue stands empty and neglected after decades of use as library storage. 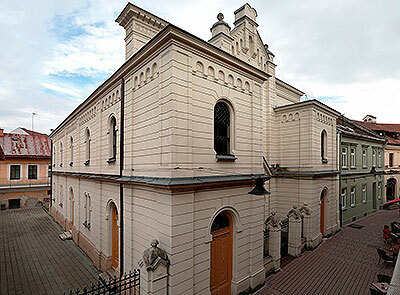 Designed by János Balog, a local contractor, the synagogue was constructed in 1899. Its Rundbogenstil western façade, topped by the tablets of the Ten Commandments, fronts on Zvonárska Street and forms the main public face of the building. 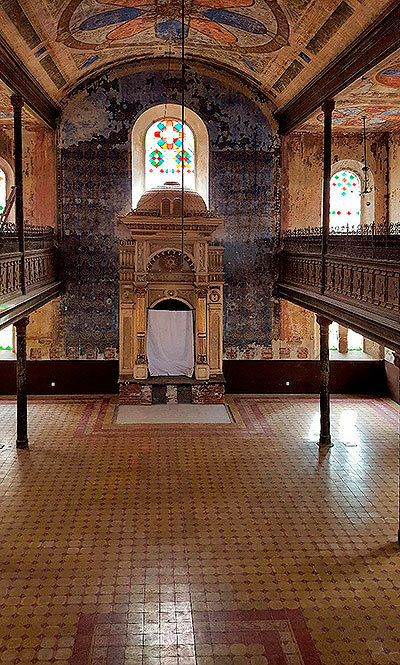 The synagogue’s interior is solemn, with the women’s gallery supported on cast-iron columns. The entire surface of the interior is covered with richly decorative wall-paintings in geometric and Moorish patterns. The hall is otherwise empty – only the ark and a basin on the western wall near the main entrance to the sanctuary – remain from its furnishings. The building is currently undergoing restoration and eventually will be used as the Memorial Museum of Eastern Slovak Jewish Communities. Plans are to inaugurate it in 2013, when Kosice will be the European Capital of Culture.